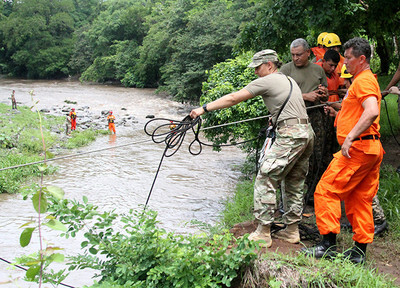 SAN JUAN OPICO, La Libertad, El Salvador – New Hampshire Army National Guard members teamed with Salvadoran soldiers and firefighters to conduct swift water rescue training in the swollen, muddied currents of the Rio Lempa about an hour northwest of the capital San Salvador from June 5 to 7. The training featured an exchange of best practices and ways to enhance reaction times and interoperability between the Salvadoran military and firefighters, said NHARNG Maj. Brian Fernandes. “We’re here to exchange ideas that can hopefully save lives,” he said. His group of five Soldiers included some with mountaineering expertise. 1st Lt. Katrina Simpson, an infantry officer with Mountain Company and a graduate of the Army Mountain Warfare School, instructed the Salvadorans on basic knots used to lash ropes together and anchor them securely to span hazard areas during rescues. They included the bowline, square, butterfly, double figure eight and clove hitch. The language barrier was breached thanks to the efforts of several interpreters, including Sgt. 1st Class Carolina Compton, a NHARNG recruiting NCO and fluent Spanish speaker. The exercise culminated with simulated rescues performed in the Lempa, darkened by the region’s rainy season. Soldiers and firefighters took turns rescuing and being rescued. Rescuers hurled ropes from the high, steep riverbanks to swimmers as the current began to sweep them downstream. Laughter and celebratory cheers met each successful throw. The exchange is one of many coordinated through the NHNG-El Salvador State Partnership Program, which links a state’s National Guard with the armed forces of a partner country in a cooperative, mutually beneficial relationship. At the end of the training, Col. Domingo Monterrosa, commandant of the host Salvadoran Armed Forces Operations Center, addressed the participants during a small ceremony and presented each NH soldier with a certificate of appreciation.